The engagement ring is made of platinum; it features a round three-carat brilliant stone flanked by smaller pavé-set diamonds. 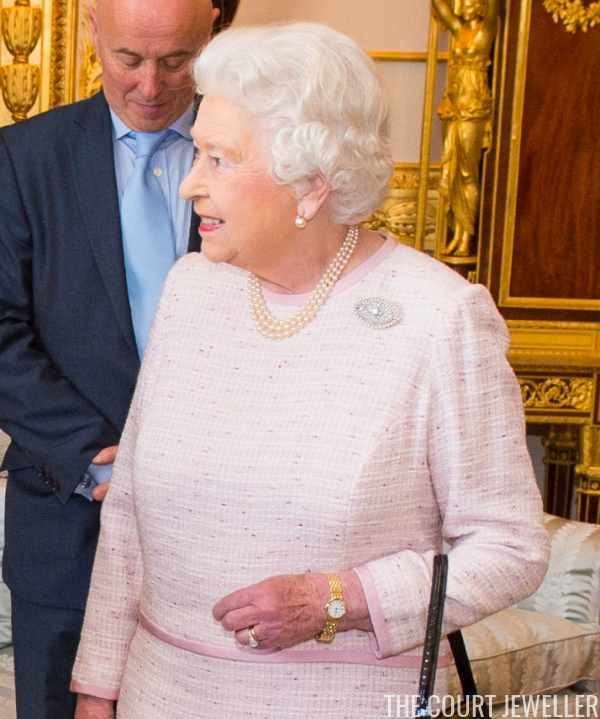 Prince Philip commissioned it from a London jewelry firm, Philip Antrobus, in 1947. 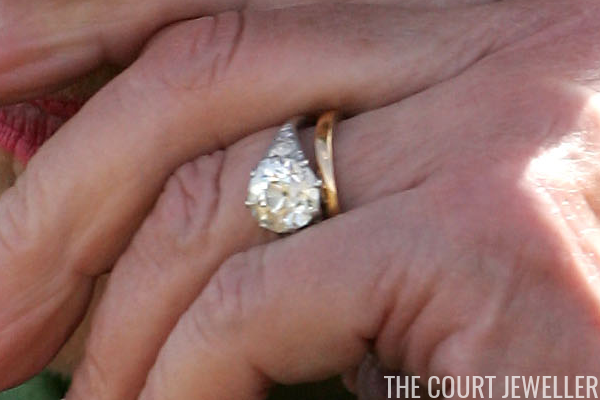 The diamonds themselves, however, had a much longer royal history. Prince Philip may have been the grandson of a Greek king, but his family had gone through all manner of exile and turmoil by the time he married in to the British royal family. But although he wasn't particularly wealthy, he was marrying a future monarch, and the engagement ring he gave her needed to be significant. His mother, Princess Alice, came to the rescue. She gave him one of her tiaras, a piece she had received as a wedding present nearly half a century earlier, so that it could be dismantled. Several of those diamonds could then be used to make Elizabeth's ring, as well as her wedding present, a gorgeous diamond bracelet. 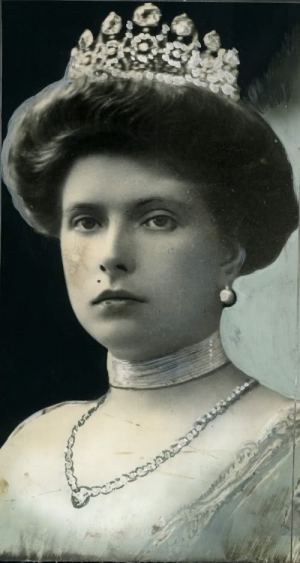 The tiara wasn't just any old wedding present, though: it was the diamond and aquamarine tiara that Alice had been given by Tsar Nicholas II and Tsarina Alexandra of Russia. Alexandra was Alice's aunt; Nicholas was a first cousin of the groom, Prince Andrew. The tiara also came with an accompanying suite of jewels. 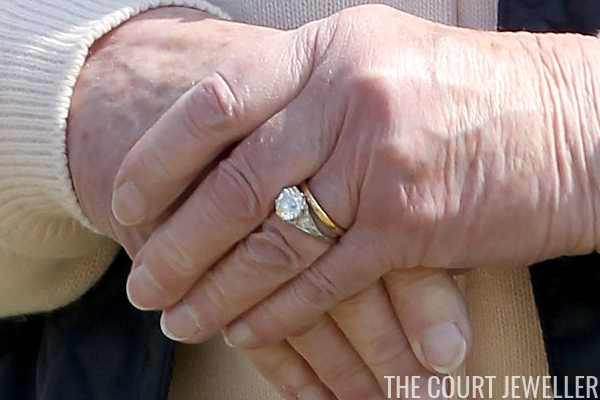 So when you see the gorgeous engagement ring glittering on Elizabeth's left hand, remember that it's not just important because it's the engagement ring of a queen -- it's an engagement ring made of diamonds that came from the last Romanov imperial couple. 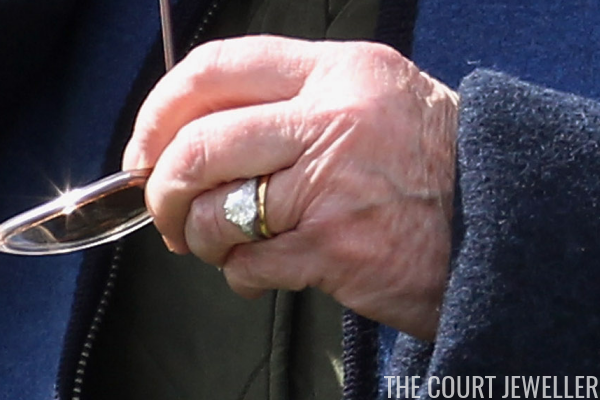 It's harder than you might think to catch a glimpse of the ring, even though she wears it daily, because she's almost always wearing gloves at public appearances. But next time you see pictures of her at palace audiences -- or, annually, at the Windsor Horse Show in May -- look out for the sparkling ring winking from her left hand.